The ruined metropolitan city of Rapture in the game Bioshock (2007) is a microcosmic incarnation of Ayn Rand’s philosophy of Objectivism. The first cut scene of the game introduces to the player the idea that Rapture was intended to be a haven for intellectual advancement free from moral constructs, but the player arrives after the city has fallen into disrepair. While navigating the ruined city, the player is presented with an array of monstrous former citizens, including splicers, deranged scientists, and Little Sisters. The Little Sisters present the player with the options of saving them for small gain or killing them for great gain. This moral quandary singlehandedly determines the narrative outcome of the game and has an impact on the ease with which the player moves through the game. When following the path where the player chooses to sacrifice morals for increased survival and ease of play, a causal relationship can be seen between the ideological structure of Rapture and the evolution of the main character. This relationship posits monstrosity as the logical conclusion of the unrestrained individualism and obsession with progress that the game derives from Rand’s Objectivism. Mark Z. Danielewski’s House of Leaves, published in 2000, is a fragmented, analytical biography of a strange, possibly haunted house delivered as a collaborative dissection of a “found footage” horror documentary. Danielewski’s novel presents the reader with a myriad of questions, one of the most prominent being “What is the house?” Incorporating the postmodernist Jean Baudrillard’s concept of the simulacara and simulation into our reading of House of Leaves as a ghost story, we can interpret the house itself as being the “ghost” of the story and Johnny as being the one haunted by it. By examining these two theories, we can see how the application of the simulacra shifts the focus of the novel from the ontological nature of the house to the pattern of transference that the story of the house follows. The application of Baudrillard’s theory allows the house to be read as an entity that requires transference from person to person to accomplish a haunting, behaving like a virus that requires movement from host to host in order to perform its function. Appendix: ‘You, who call Frankestein your friend, seem to have a knowledge of my crimes and his misfortunes. But, in the detail which he gave you of them, he could not sum up the hours and months of misery which I endured, wasting in impotent passions. For while I have destroyed his hopes, I did not satisfy my own desires. They were forever ardent and craving; still I desired love and fellowship, and I was still spurned. Was there no injustice in this? Am I to be thought the only criminal, when all human kind sinned against me? Why do you not hate Felix, who drove his friend from the door with contumely? Why do you not execrate the rustic who sought to destroy the saviour of his child? Nay, they are virtuous and immaculate beings! I, the miserable and the abandoned, am an abortion, to be spurned at, and kicked, and trampled on. Even now my blood boils at the recollection of this injustice.’ Shelley, page 223-224. Mary Shelley’s epistolary Frankenstein chronicles the descent into madness of its title character, Victor Frankestein, after his success in creating and animating a human-like being. The nameless creature chases and torments Frankenstein until his death in the Arctic, where the creature comes face-to-face with the man dictating the story. Published in 1818, the novel was surrounded by concepts and ideas that find their origins in the romantic ideals of the 18th century. Not to be confused with the Romanticism of some of Shelley’s contemporaries, the impressions of these romantic ideals can be felt strongly in the correlation drawn between outward beauty and inward virtuosity and goodness. Through the voice of Victor Frakenstein, the idea that one’s appearance is directly informed and shaped by the presence of natural goodness is reinforced repeatedly in the novel. This ideal is one that consistently informs the treatment of the creation, and the creature itself directly confronts this superficiality with a barrage of rhetorical questions. These questions force Walton and his audience, the readers, to turn a critical eye inwards and address the source of the fear that guided the treatment of the creature. The passage being addressed takes place on the penultimate page of the novel, at the moment when the creature visits the dead Frankenstein. Before delving into the heart of the passage, however, there’s a moment in the first line of the selection that casts an interesting shadow on the interpretation of this piece. Recalling again that Frankenstein has been narrating his story to a third party, the monster begins speaking to Walton by saying “You…seem to have a knowledge of my crimes and his misfortunes. But, in the detail which he gave you of them, he could not sum up…the misery which I endured” (Shelley, 223-224). Here the creature very fairly points out a blemish in the situation; Frankenstein has only imparted his half of the exchange with the creature; Victor relayed its crimes and his own suffering at the hands of the creature, but he wasn’t capable of expressing the misery that the creature would have endured during its existence. This immediately savors of unreliable narration, and the creature, having successfully undermined Frankenstein’s narrative authority, lays into Walton with a barrage of questions. There’s a mild anaphoric element present in the rhetorical questions posed by the creature in the heart of this paragraph. Each statement begins with a form of a question: “Was there”, “Am I,” and “Why…Why” all pepper the reader with the creature’s pain and frustration at the responses he received from humans at no other provocation than his visage. The creature, all the while acknowledging the horrors he committed against Frankenstein in the line “while I have destroyed his hopes” (Shelley, 224), reminds Walton of what he has endured from people he caused no harm. The line “Am I to be thought the only criminal” begs the question of why the humans aren’t treated with the same amount of malice as him, but the sarcastic answer of “Nay, they are virtuous and immaculate beings!” (Shelley, 224) demonstrates the monster’s awareness of the fact that beauty is enough for absolution, and that he is thought to be deserving of rejection because of his appearance. The creature explains that all he desired was “love and fellowship” (Shelley, 224), and he heavily implies in the passage that his crimes are in direct response to the way he was dismissed. Looking at the evidence from this passage, we can begin to unravel how the creature became a monster under the influence of the beauty/morality concept, and in turn undermine the judgmental foundations for the humans’ treatment of the creature. As the title suggests, I’m interested in the way that the house reacts to the presence of the difference characters in the book. When considering this analysis, a couple things have to be assumed: 1) the house is haunted/the anomalous nature of the house is the “ghost” or monster of the story; 2) the accounts given in the Navidson Record are accurate; 3) the house is self-aware. Now, keeping the aforementioned implications in mind, I was interested in a little bit of information that seemed like a throwaway. In one of Zampanò’s sections, he brings up an idea discussed by one of his “sources”; that “…the house’s mutations reflect the psychology of anyone who enters it.” (165) This is sort of the crux of my idea about the kind of ghost that the house is. More clarification: “ghost” is a very loose term. I don’t necessarily mean a ghoul or a lingering spirit, but more a malevolent, ambient force that is supernatural in nature (and not necessarily human in origin, i.e. the ghost of a person). I was more interested in the manner that the house haunted the characters and not so much in defining the thing doing the haunting. Going back to the line supplied by Zampanò, we can see how this theory works when we examine the different interactions the house has with the characters. Tom’s final stunt with the house was the only one where the house responded to him directly; after he successfully removes Daisy from harm, the house drags him away from his brother. This is a reflection of the way that Tom was always behind his brother, unable to catch up to his fame and success. It’s also indicative of the seemingly insurmountable distance that existed between the brothers for so long – and that Will is easily capable of returning to (“This is what Tom does best. He lets you down.” 277). The house pulls Tom away from Will and then destroys his hands, which are his livelihood, and then devours him. Whenever the house wished to “haunt” Karen, it simply created claustrophobic spaces. It took what she loved and needed (her children, Will) and put them in places that she was unable to go into, like with the initial introduction of the hallway. When the house attempted to take her, it simply put her in a small, dark space and waited. There are so many other examples (Will and Holloway providing an entire paper’s worth) that illustrate how the house responds to its inhabitants with hand-tailored hauntings. Reading the house as an intelligent, responsive entity gives me the satisfaction in finding a true antagonist in the novel; I picked up the book expecting a horror novel with a more or less defined monster, and this reading allows me to have one without bending the text too much. There was a passage at the tail end of the third chapter of volume three that shed a particular light on the storytelling methods of Victor Frankenstein. On page 175, right after he’s destroyed the female half-creature, Victor gives his audience (Walton) an assessment of his situation: “I had resolved in my own mind, that to create another like the fiend I had first made would be an act of the basest and most atrocious selfishness.” This statement serves to complicate interpretations of Frankenstein’s moral leanings throughout Shelley’s novel. Throughout the course of his wanderings, Victor has made it evident that his family is not necessarily a top priority. He abandons his house for years at a time, returning to Geneva in times of grief to indulge in his reclusiveness in the company of his family, then fleeing again. When he does exhibit concern for them, it is directly related to their proximity to creature-induced danger. Victor and his creature are at the epicenter of his focus; everything else falls away in importance by orders of magnitude. He emotes this very clearly and lengthily on page 90 of the novel. The fact that the story is told by Frankenstein automatically puts the reader at a disadvantage in respect to authenticity. What this particular line does is demonstrate Victor’s attempts to undermine some of his accountability for the creation of the monster and cast himself in a more noble light. Returning to his selfishness outlined previously, the interpretation of egotism comes from the same chapter as the quotation. In the first two pages of chapter three, Frankenstein ruminates on all the possible ways that the two creations could/would wreak havoc on the world, and in doing so strips the monster(s) of all of their autonomy and places himself in knowing superiority over them. His ego feeds into his hatred and solidifies his abandonment of his task, and when he comes to rationalizing away his decision, he flips the logic of his dilemma in a way that seems reasonable at face value. Going back to the quote, we see that Victor treats the fulfillment of his promise to his creation as the ultimate selfishness; how can this be so, when we’ve seen so much of the pain of the creature and the danger he poses to Victor and his own family? It would make sense to the reader that creating two of these “monsters” in order to secure safety would be selfish, but Victor’s denial of his creation’s capacity for compassion/reason/civility as part of his justification for this idea continues to strengthen the guiding hand Victor has on the reader’s interpretation of his own virtuosity. Aside from the immediate unease offered by the grisly scene presented by the first page of the comic, the necessity of the reader’s choice to engage and the “path” travelled by the scrolling patterns of the major contributors to the overall dread and horrific impact. The conceit of horror films and animated horror series is that you are being told a story; you passively accept the images, sounds, and dialogue of the tale, and your engagement is limited to your mere presence. Em Carroll, through her use of interactive choice and unpredictable scrolling, removes the passivity of the audience and forces them to choose to immerse themselves in the story and walk (with keystrokes) through the panels of the comic. 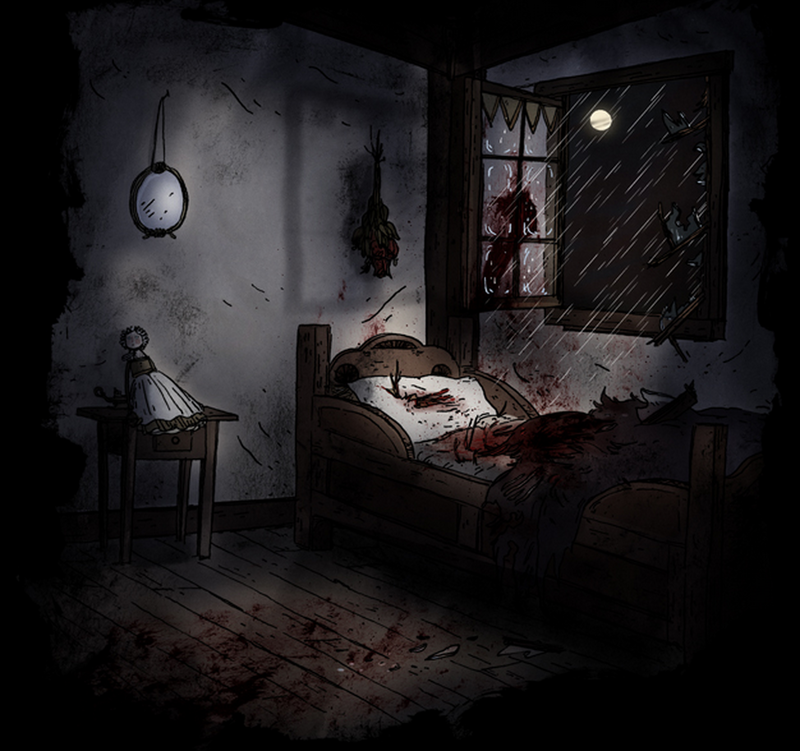 The entire story requires being actively unpacked by the reader to be told; once again, this aspect of MARGOT’S ROOM is one of the defining horror elements. The chapters that best display the interfacing of this narrative style and the scrolling involved in the comic are chapters V and II. While very difficult to capture, we see that at this point in Chapter II there is a near-physical “drop” in the story. The reader has to adjust their scrolling, changing the orientation of the comic and providing a sense of dread at the literal descent in the narrative path – again, a descent that the reader chooses to follow, which heightens the suspense of the unfolding dialogue. This combination of effects is felt the most in Chapter V, where the reader reaches the “climax” of the story. 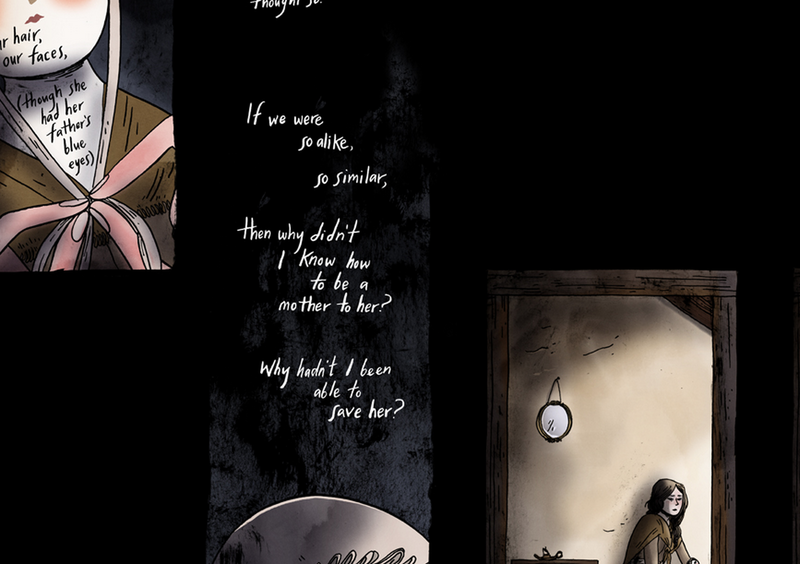 There are three more of the drops mentioned earlier, and following the trail of the panels is at its most difficult and unsettling in this chapter. The discordant movement of the story from panel to panel drags the reader further and further down the screen, at times losing them in the blackness of the background page until they manage to stumble upon another unsettling panel of the murder at the end of the story. This physical element breaches one of the only sanctities found when regarding horror: the fact that you are completely disconnected, physically, from the story. Carroll’s uses of the discussed techniques creates deep intimacy between the story and the reader, allowing the comic to transcend the flat, distant nature of horror media.